The SNP's Scottish election victory was a success for the party rather than the cause of independence, a new study has suggested. Researchers also found that many people voted for the Nationalists because they thought Alex Salmond would make a good first minister. The Scottish Centre for Social Research asked almost 1,300 people their views on Scotland's constitutional future. A total of 23% said they were in favour of independence. More than half of those questioned between May and August this year added that they wanted a devolved parliament with taxation powers. Instead of winning on the back of rising support for independence, the study suggested that the SNP was victorious because it had become better at winning the votes of those who already backed the concept. 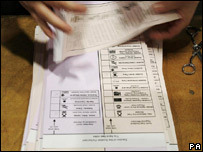 Three quarters of those favouring independence, it claimed, voted Nationalist in the regional ballot in May, compared to half in the 2003 election. 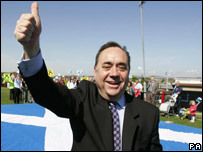 When asked to score Alex Salmond's potential as first minister, 44% of the interviewees awarded him seven or more out of 10, compared to 23% for the then Labour leader Jack McConnell. The SNP was also more effective at putting over the message that it was "Scotland's party", with 24% saying the SNP looked "very closely" after the interests of people in Scotland, compared to Labour's 7%. The survey, which will be unveiled at a conference in Edinburgh on Wednesday, also found that most voters understood the Single Transferable Vote system (STV) used for the first time in May for the council elections. Just 23% said that ballot paper was hard to complete, compared to 27% in the case of the Holyrood ballot paper. Professor John Curtice, a co-director of the study said: "The SNP's victory in May was a success for the party rather than the cause of independence that it espouses. "It had a popular leader and tapped a feeling that Holyrood should put Scotland, rather than partnership with London, first. "This enabled the party to win the votes of those who already backed independence rather than win new converts to the independence cause." Labour said the findings showed SNP claims of growing support for independence to be "hollow." The party's Cathy Jamieson added: "This report shows that most Scots don't agree with Alex Salmond and that the majority of people in Scotland don't want to separate from the rest of the UK. "So much for the strength of Alex Salmond's argument on independence. "It's time the SNP respected the will of the Scottish people and instead of picking fights and doing down devolution, got on with the job of government in Scotland." Annabel Goldie, Scottish Conservative leader, said support for independence was at its lowest level for a decade. She said: "There is a clear implication for the three unionist parties - hold true to your principles, overwhelmingly Scotland agrees with you. "But there is also a stark message for the SNP. You are not there to grandstand on the world stage. "You are not there to bicker for bickering's sake with Westminster. You are there to deliver on the bread and butter issues." Liberal Democrat leader Nicol Stephen challenged Mr Salmond to scrap his independence White Paper in light of the findings. "The low support for independence is the big message in this research," he said. Responding to the survey, an SNP spokesman said: "This poll shows that the SNP is winning the support of the Scottish people with more Scots trusting the SNP to stick up for Scotland and more Scots backing Alex Salmond as first minister. "The SNP is clearly the party in tune with the Scottish public." How to fund Scottish independence?